The Peoples Democratic Party (PDP) governorship primaries in Kwara state today was cancelled as a result of a clash between supporters of the two leading contenders. An alleged clashed between loyalists of Bolaji Abdullahi and Razak Atunwa, two top aspirants, reportedly led to the cancellation of the exercise. The primaries was said to have been going on smoothly at Banquet Hall, opposite government house, Ilorin, until some confusion set in over alleged attempt by some delegates to manipulate the voting process. 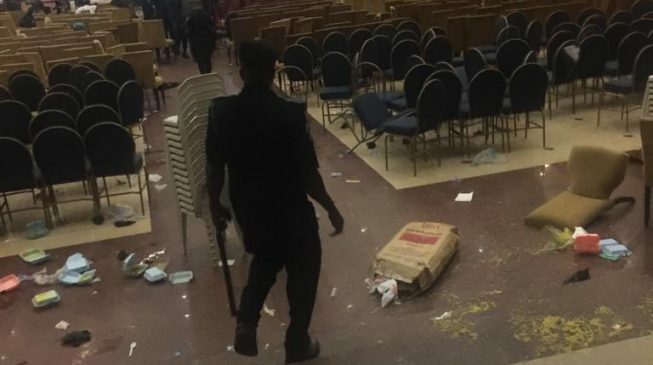 Ballot boxes were broken and the materials used for the election destroyed. Security operatives made attempt to calm the angy protesters but did not succeed in doing so. A party official said the delay in sharing food to the delegates led to the commotion.